Wireless LAN coverage is an ever-increasing necessity of the modern workplace, especially as mobile technologies such as smartphones and tablets become commonplace at work. Users are no longer fixed to desks with a single desktop PC for connection to the network - multiple services can easily be established from a single end user device: a smartphone has the capability to make phone calls, share video data calls, whilst sharing and checking emails, as an example. It’s therefore imperative that the wireless service that carries this information has the ability to distinguish between these differing streams of data, so that any Quality of Service may be applied. This not only ensures business critical applications are guaranteed as they traverse the network, but also ensures that non-business critical applications can be dropped if necessary. A wireless LAN solution that allows flexibility, mobility, security, visibility and control will be fundamental to achieving this working environment. 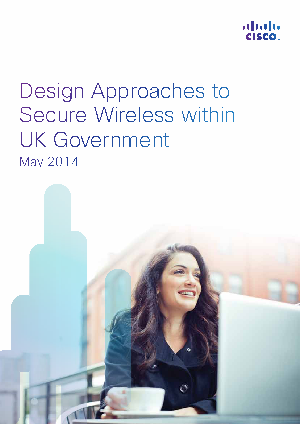 To realise these benefits, this document outlines the possible approaches of a Cisco wireless LAN infrastructure that could be deployed within a secure environment. A typical example of which could be UK Central Government Departments where the network may be accredited to carry classified data with the need to apply additional technical controls to protect sensitive data.